Beyond Sacred is an interview-based theatre piece exploring the diverse experiences of young Muslim New Yorkers. The five participants in Beyond Sacred vary in many ways, but they share the common experience of coming of age in a post-9/11 New York City at a time of increasing Islamophobia. A production of Ping Chong + Company, written by Ping Chong, Sara Zatz, and Ryan Conarro, in collaboration with the performers. 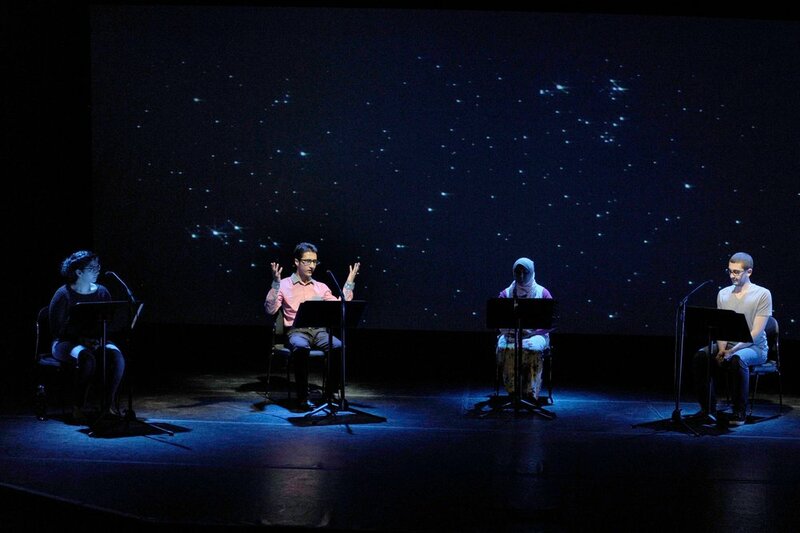 A Ping Chong + Company production, Beyond Sacred: Voices of Muslim Identity is written by Ping Chong, Sara Zatz, and Ryan Conarro, in collaboration with the performers: Tiffany Yasmin Hosein, Ferdous Dehqan, Kadin Herring, Amir Khafagy and Maha Syed. It’s an interview-based theatre piece exploring the diverse experiences of young Muslim New Yorkers. The five participants in Beyond Sacred vary in many ways, but they share the common experience of coming of age in a post-9/11 New York City at a time of increasing Islamophobia. Participants come from a range of cultural and ethnic backgrounds and include men and women that reflect a wide range of Muslim identities, including those who have converted to Islam, those who were raised Muslim, but have since left the faith, those who identify as “secular” or “culturally” Muslim, and those who are observant on a daily basis. Beyond Sacred illuminates the stories and daily lived experiences of these five people, and the piece works to foster communication and understanding among Muslim and non-Muslim communities in New York. Commissioned by LaGuardia Performing Arts Center, with support from APAP and the Doris Duke Foundation Building Bridges Grant.